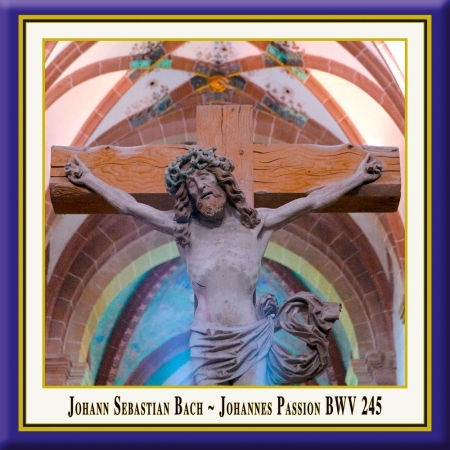 his live recording is part of a cycle of oratorios, masses and other grand works, performed in the basilica of Maulbronn Abbey under the direction of Jürgen Budday. The series combines authentically performed oratorios and masses with the optimal acoustics and atmosphere of this unique monastic church. This ideal location demands the transparency of playing and the interpretive unveiling of the rhetoric intimations of the composition, which is especially aided by the historically informed performance. The music is exclusively performed on reconstructed historical instruments, tuned in the pitch, which was customary during the composer's lifetime (this performance is tuned in a' = 415 Hz). 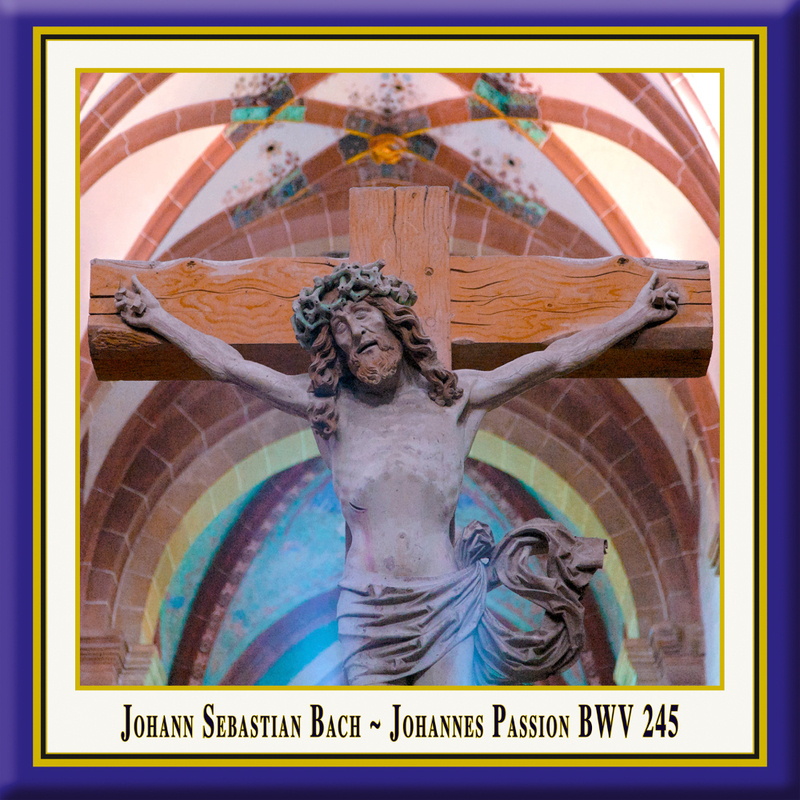 he Passio Secundum Johannem (also known as St John Passion) is the earliest of the known Passion cantatas of J. S. Bach, among which only the St John Passion and St Matthew Passion can be said to have largely preserved their authentic character. A St Mark Passion exists only by libretto. The premiere of the first edition as presented here took place on Good Friday, 7th of April 1724, during the vespers in the church of St Nikolai in Leipzig, shortly after Bach's 39th birthday. In the following years Bach kept changing the work for subsequent staging, so his latest version dates perhaps up to 1749. As major textual basis Bach choose the passion narrative of the Gospel of John as translated by Martin Luther. It was supplemented by smaller passages of the Gospel of Matthew and some free insertions of contemplating character whose provenance remains unclear. The narrative is framed by chorals largely consisting of lyrics from well-known protestant hymns from the 16th and 17th century. The work is organized in two parts: the first tells about the betrayal of Jesus, his capture and Peter's Denial, the second part deals with the examination, trial, crucifixion and his burial. After the death of Bach in 1750, his complete works disappeared little by little from public perception and fell into oblivion, thus also his Passion cantatas. It was to the director of the Sing-Akademie zu Berlin (one of the world's oldest mixed choral ensembles), Carl Friedrich Zelter, and 20-year-old Felix Mendelssohn Bartholdy to bring the St Matthew Passion to performance again after a hundred years, on the 11th of March 1829; thereby initiating a broad movement of a return to Bach's oeuvre, for example a processing of the St John Passion by Robert Schumann in 1851, who described it as "much more venturous, powerful, and poetic than the one after St Matthew […] thoroughly genius, and with great artistry". 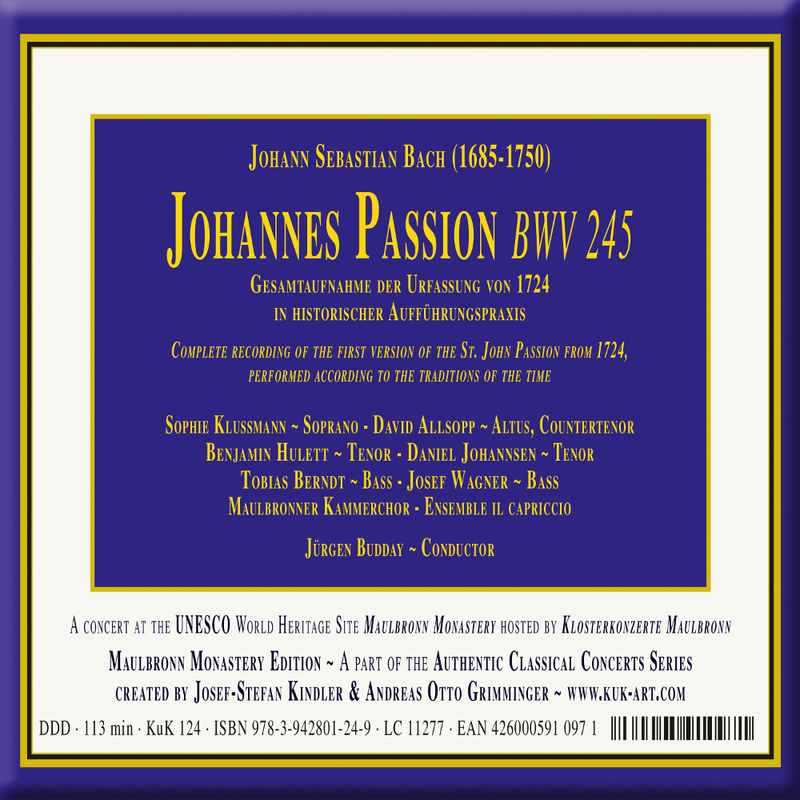 Today, St John Passion ranks among the central works of European musical history. Born in 1978, the Austrian tenor is one of the most sought-after Evangelists and Bach interpreters of his generation. After completing his training as a church musician, he studied voice with Margit Klaushofer and Robert Holl in Vienna. He participated in master classes with Dietrich Fischer-Dieskau, Nicolai Gedda and Christa Ludwig and was a prizewinner at the Bach, Schumann, Mozart, Hilde Zadek and Wigmore Hall Competitions. Since his debut in 1998, appearances as a concert, lieder and opera singer have taken him to the major musical centres of Europe, North America, Japan and the Middle East, where he sings works from every period. In addition to regular concerts at the Vienna Musikverein and Konzerthaus, he appears at leading festivals (Styriarte Festival in Graz, Salzburg Festival, Carinthian Summer, Israel Festival, La Folle Journée, International Herrenchiemsee Festival, several international Bach festivals). He performs under such distinguished conductors as Sir Neville Marriner, Bertrand de Billy, Jordi Savall and Enoch zu Guttenberg with various ensembles, including Le Concert des Nations, the Vienna Philharmonic and the Gewandhausorchester Leipzig. Daniel Johannsen is also involved in several large-scale Bach cantata projects. The lyric tenor is engaged by such theatres as the Munich State Theater on Gärtnerplatz, the Leipzig Opera, the Vienna Volksoper, the Lucerne Theater, the Bonn Opera and the KunstFestSpiele Herrenhausen (Hannover), where he is heard in Mozart roles, Baroque, 20th-century and contemporary works as well as several operetta roles. Song recitals featuring the entire range of German repertoire, in addition to English and French compositions, are a central focus in the work of the singer, who collaborates with such pianists as Simon Bucher, David Lutz, Burkhard Kehring and Helmut Deutsch. Daniel Johannsen's recording of the 'Dichterliebe' was released in spring of 2010, following his first solo CD, 'Tenore & Traverso' with arias by J. S. Bach, which received the ORF Pasticcio Award. In addition, numerous other recordings, radio and television broadcasts document his creative output. During the 2014/15 season Daniel Johannsen appeared at the 'Styriarte' (together with Nikolaus Harnoncourt) and at the Herrenchiemsee Festivals. He gave recitals at the Oxford Lied Festival as well as at the Schubertiade Israel (together with Graham Johnson) and followed invitations to Sächsische Staatskapelle Dresden, Bachakademie Stuttgart and Thomanerchor Leipzig. He repeatedly sung the title role in Benjamin Britten's 'Albert Herring' at the Vienna Volksoper and made his debut singing the role of 'Belmonte' in Mozart's 'Die Entführung aus dem Serail' under Michael Hofstetter at Giessen Theater. The native Berliner Tobias Berndt began his musical training with the Dresden Choir of the Church of the Holy Cross. He studied with Hermann Christian Polster in Leipzig and continued his training with Rudolf Piernay in Mannheim. During further studies and master's courses, he worked with Theo Adam, Wolfram Rieger, Norman Shetler, Irwin Gage, Axel Bauni, Julia Varady and Dietrich Fischer-Dieskau. Accredited with multiple scholarships and prizes, he was the 1st prize winner at the Brahms Contest in Pörtschach 2008 and at the Cantilena Song Contest in Bayreuth 2009 and also won the Thomas Quasthoff initiated contest 'Das Lied'. His comprehensive concert repertoire has ranged from Monteverdi's compositions through to works of the 20th Century as well as important pieces from Bach, Handel, Brahms and Mendelssohn. In addition to numerous operatic engagements, Tobias Berndt also focuses intensely on song singing and is a regular guest at festivals such as the Salzburg Festivals, the Prague Spring, the Leipzig Bach Festival, the Handel Festivals in Halle, the MDR Music Summer and the European Music Festival Stuttgart. His many concert appearances have taken him across Europe, to the USA, Chile, Japan and South Korea. Radio and CD recordings are testament to his artistic works. The German soprano Sophie Klußmann, a student of Thomas Quasthoff and Margreet Honig, has a warm, wide-ranging and dark-hued voice; though lyric in nature, it has dramatic potential and can assert itself without strain against a large orchestra. Rapidly building an international reputation as an operatic and concert performer in a diversity of styles and repertoire, Sophie has sung the major roles of her genres at the Halle Opera in Germany, was 'Pamina' at Berlin's Seefestspiele and covered 'Anna Netrebko' as 'Donna Anna' at the Baden-Baden Opera Festival. The composers Christian Jost and Edward Rushton have written operatic roles for her and she took the female lead opposite John Malkovich in his theatre piece The Giacomo Variations. In concert, she has collaborated with conductors like Marek Janowski, Ingo Metzmacher, Helmuth Rilling, Michael Sanderling and Karl-Heinz Steffens in works by Beethoven, Brahms und Mahler, and with leading figures in the field of historically informed performance such as Marcus Creed, Václav Luks and Martin Haselböck. In the chamber and song repertoire, she has a particular passion for music from the late 19th and early 20th centuries. David Allsopp was a choral scholar at King's College, Cambridge, where he studied computer science, and subsequently a lay clerk in Westminster Cathedral Choir, before pursuing a freelance career. In addition to solo engagements, he continues to perform and record with both English and continental consort groups and is also a member of the early music ensemble 'Gallicantus'. David's performances have included many of Handel's oratorio works and Bach's major choral works and cantatas in venues all over Europe. He has recorded 'Israel in Egypt', 'Joshua' and 'Jephtha' on K&K Verlangsanstalt Maulbronn Monastery Edition. While much of the countertenor's repertoire is baroque, David makes occasional forays into more modern repertoire with performances of Arvo Pärt's 'Passio', Orff's 'Carmina Burana' and Bernstein's 'Chichester Psalms'. His consort performances have encompassed a wide repertoire ranging from the fourteenth century right through to contemporary music, including many premières. Concerts this season include a tour with recording of 'Israel in Egypt' with Le Concert Lorrain, 'Messiah' performances and recording with the New Philharmonie Utrecht, Bach's 'Magnificat' and 'Cantata 36' with the Choir of King's College, Cambridge and Handel's 'Dixit Dominus' with the Gabrieli Consort and Players. The British tenor studied Music as a choral scholar at New College, Oxford and Opera at the Guildhall School of Music and Drama in London. He was a soloist at the Hamburg State Opera from 2005 to 2009 and has achieved great success in lyric roles. He made his debuts at the Bayerische Staatsoper, Munich in Handel's 'Alcina', at Theater an der Wien in the world premiere of Johannes Kalitzke's 'Die Besessenen', Baden-Baden Festspielhaus in 'Salome', returning for 'Die Zauberflöte', Salzburger Festspiele in 'Elektra', Buxton Opera Festival in Lortzing's 'Der Wildschütz', Rossini's 'La Pietra del Paragone' at Opera Rennes, for Grange Park Opera as Ferrando and has returned to Hamburg as 'Tamino' and 'Narraboth' (Salome). He made his debuts with Opera North as 'Peter Quint' (The Turn of The Screw), Berliner Staatsoper as 'Hippolyt' in Henze's 'Phaedra', 'Fenton' in 'Falstaff' for Opera Holland Park, in Sir Jonathan Miller's 'St Matthew Passion' at the National Theatre, 'Die Frau Ohne Schatten' under Vladimir Jurowski in Amsterdam, the title role of J.C.Bach's 'Lucio Silla' for Salzburg Mozartwochen under Bolton, 'Tamino' (Die Zauberflöte) with the Berlin Philharmonic Orchestra under Rattle and as 'Madwoman' (Curlew River) for Rome Opera under James Conlon. As a concert performer he has worked with conductors including Sir Roger Norrington, Sir John Eliot Gardiner, Sir Andrew Davis, Phillippe Herreweghe, Christopher Hogwood, Trevor Pinnock, Emmanuelle Haim, Markus Stenz, Ivor Bolton, Jeffrey Tate, Simone Young, Frans Brueggen, Jaap van Zweden and Fabio Biondi amongst others at the BBC Proms, Edinburgh Festival, Holland Festival, Musikfest Bremen and many other leading festivals and venues. The musical training of the bass baritone Josef Wagner, born in Niederösterreich (Lower Austria), began in a boys choir, and with violin and piano lessons. After deciding for a career in voice, he studied at the University for Music and the Performing Arts in Vienna with Kurt Equiluz and Robert Holl. He has received important artistic incentives in master classes of Paul Esswood, Walter Berry and Christa Ludwig. His present teacher is Prof. Wicus Slabbert. After his stage debut as 'Don Alfonso' (Così fan tutte) and 'Dulcamara' (Elisir d'amore) he became a member of the ensemble of the Vienna Volksoper in 2002. There he expanded his repertoire considerably and sang a.o. 'Figaro' (Le Nozze di Figaro), 'Papageno' (Zauberflöte) and recently with sensational success the title role in the Achim Freyer production of 'Don Giovanni'. He still feels closely connected to this house. In summer 2006, Josef Wagner gave his debut at the Salzburg Festival as 'Don Cassandro' (La Finta Semplice). Since then he has been working as a freelance singer, performing e.g. 'Konrad Nachtigall' (Die Meisteringer von Nürnberg) at Geneva Opera, 'Guglielmo' at Opera Ireland and 'Papageno' at Hyogo Performing Arts Center in Japan. Further engagements included appearances as 'Herkules' in Anton Schweitzer's 'Alceste' with Concerto Cologne under the baton of Michael Hofstetter; 'Lord Sidney' (Viaggio a Reims) at Israeli Opera, 'Nick Shadow' (The Rake's Progress) at Opera Nantes, 'Frank' (Fledermaus) at Geneva Opera, 'Escamillo' with Bavarian Radio Orchestra and in Tel Aviv, 'Eduard' ('Neues vom Tage' by Hindemith) and 'Pantalone' (Turandot by Busoni) at Dijon Opera, as well as 'Leporello and Publio' (La Clemenza di Tito) in Marseille. He is also regularly guest at Opera Vlaanderen where he sang 'Don Alfonso', Ercole/Giove in Cavalli's Giasone, 'Assur' (Semiramide) with Alberto Zedda conducting, 'Fra Melitone' (La Forza del destino) and the title role in 'Don Giovanni'. At Deutsche Oper Berlin he participated in a concert version of 'Le Vaisseau Fantôme' (by Pierre-Louis Dietsch). With great success he sang 'Jochanaan' at Royal Opera Stockholm by Nina Stemme's side, 'Papageno' at the Festival Aix-en-Provence as well as 'Golaud' (Pelléas et Mélisande) at Deutsche Oper Berlin. Further projects include 'Figaro' with Canadian Opera Company Toronto, the 'Ruler' (The Miracle of Heliane) at Deutsche Oper Berlin, 'Guglielmo' at Marseille Opera. He will return to Volksoper Vienna with 'The Tales of Hoffmann' and in the title role of 'Don Giovanni', and to Opera Vlaanderen as 'Papageno'. He will sing the role of the 'Musiklehrer' (Ariadne auf Naxos) at Opera Nancy and at the Festival of Aix-en-Provence and give his role debut as 'Eugene Onegin' in Helsinki. Josef Wagner is also greatly in demand as a concert singer, whose repertoire ranges from Baroque to contemporary pieces. He has performed under the conductors Ton Koopman, Dennis Russel Davies and Nikolaus Harnoncourt e.g. at Wiener Musikverein, Wiener Konzerthaus and the Festival of Ludwigsburg (Ludwigsburger Festspiele). He also often appears as a Lied singer, 'Die Winterreise' and 'Die schöne Müllerin' belonging to his favourite repertoire. The Maulbronn Chamber Choir (German: Maulbronner Kammerchor) was founded in 1983 and counts today as one of the renowned chamber choirs in Europe. Awards like the first places at the Baden-Württemberg Choir Competitions in 1989 and 1997, the second place at the German Choir Competition in 1990, the first prize at the German Choir Competition in 1998, the second place at the International Chamber Choir Competition in Marktoberdorf 2009 and the first place at the Malta Choir Competition show the extraordinary musical calibre of this ensemble. The Chamber Choir has managed to make quite a name for itself on the international scene, too. It was received enthusiastically by audiences and reviewers alike during its debut tour through the USA in 1983, with concerts in New York, Indianapolis and elsewhere. Its concert tours in many European countries, in Israel and Argentina as well as in South Africa and Namibia have also met with a similar response. Since 1997 the choir performs oratorios by George Frideric Handel each year. All these performances were documented on disc; because of that the Maulbronn Chamber Choir holds a leading position as a interpreter of this genre internationally. Founded in 1999, it evolved into a personally, stylistically and musically very individual ensemble. Its members, meeting up from all over middle Europe for mutual working sessions are outstanding musicians of international ensembles and professional orchestras or teachers at a conservatory. All musicians of Il Capriccio have intensively occupied themselves since their studies with historically informed performance. The usage of original instruments only constitutes the sounding foundation for an extremely meaningful and vivid way of musical interacting on stage. Il Capriccio gives concerts in variable instrumentation from the size of a baroque orchestra to the classical string quartet consisting of the principals of the ensemble. The solo part for violin plays the art director Friedemann Wezel. Additionally, Il Capriccio cooperates with important artists such as Sergio Azzolini (bassoon) or Markus Brönnimann (flute). A further and exceptional obligation considering the educational support of young artists was accepted by the 2004 founding of the 'Il Capriccio Strings Academy'.